Author: Raija Kramer. Series edited by: Wilhelm J.G. Möhlig, Bernd Heine. This book presents a functional description of Fali, a language spoken in the North region of Cameroon. Classified by Greenberg as belonging to the Adamawa subgroup of the Niger-Congo phylum its Adamawa membership is quite controversial nowadays. A detailed depiction of various linguistic issues concerning Fali is exposed in seven chapters. 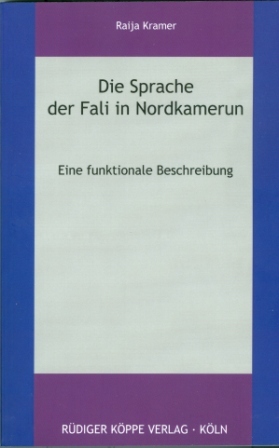 The first part gives an overview of the geographical, historical and cultural background of the speakers, discusses external and internal linguistic classifications of the Fali language and explains the theoretical framework underlying the author’s analysis (Functional Grammar and Grammaticalization Theory). The second chapter provides a phonological outline considering also the syllable structure and tonal system. The following chapters, three to seven, represent the book’s core and describe lexical categories, TAM categories, noun phrases, predications and the morphosyntactic interface of pragmatic functions. Focusing on language’s communicative functions and goals the description and analysis of the Fali language is mainly based on (semi-)spontaneous texts as narratives or short dialogues. Therefore a broad selection extracted from a more comprehensive corpus of data gained primarily in natural communicative settings is delivered in the different sections of the book.